a fall wishlist, just because. Fall is nearly here you guys. Can you sense it, too? Fall is absolutely the season that makes me want to have new (or new-to-me, anyway) things. Is “back-to-school shopping season” ingrained in my psyche? Or is it just that I love everything about fall, and want to feather my nest for hibernation? I don’t know what is it exactly. So I’m “window shopping” the things that are cozy, comfy, and make me smile for the upcoming season. Justina Blakeney’s book “The New Bohemians“, which has been on my wishlist as a pre-order for months. I just LOVE everything she does. Wine making supplies and a kit or two. This is my next homemaking/self-sufficiency hobby, possibly this next winter or spring. I can’t wait to try this out! A cute owl mug would make me smile every morning! I love tunic dresses, and I would love a couple for fall/winter. I’d probably wear them daily. So comfy and practical. With leggings and a headband, I’d be ready in 3 minutes flat and look like I actually tried to care. Ha! 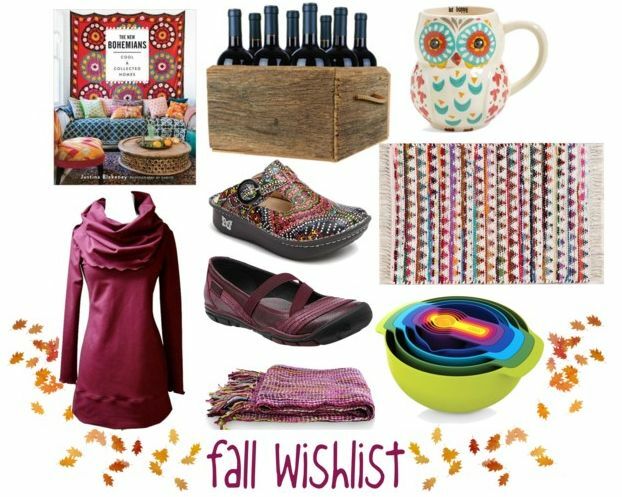 Alegria clogs and Keen crisscross shoes – comfy, cozy feet season! I actually NEED something like these. I already have some Alegrias I love, but they are a bit on the snug side (my feet grew a little during pregnancy and didn’t shrink back down to size so most of my shoes are a little snug:(..). Love this rainbow rug from Urban. (I hate that I love their rugs so much because I try to avoid shopping there – or even wanting to shop there.) Basically if I ever won the lottery I’d spend a few grand on rugs and save the rest. They are the luxury I’d love to splurge on. A pretty throw blanket. I LOVE LOVE LOVE Novica. Check them out. It’s good shopping karma. These nesting bowls are so pretty, cheerful and practical for the camping trailer. I’d want to keep them in the house and use them daily, though, because they are so fun! Any extra money for the next couple months is/was allocated to finishing the basement kitchenette, a new car seat, and our Yellowstone trip. Window shopping it is! But it totally gets it out of my system. It’s a strategy that really works for me! What are you wishing for for fall?